Why a Camel? Well, we already have llamas & alpacas on our 200-acre farm, and we saw Kazzie while visiting a nearby animal park, in the "petting zoo" area, which was not the right place for a camel to be. So, we bought him and hand raised him will all the love and patience one would give to a new puppy. 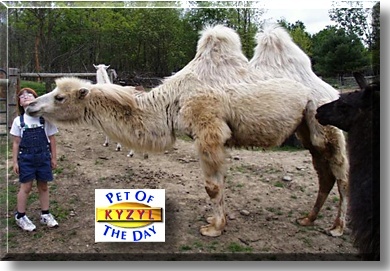 At four, Kaz is regularly visited by pre-schoolers, the handicapped, and drop in visitors to the farm, and is always ready to give out big camel kisses. Bactrians are very gentle, curious, and smart. Even we had second thoughts after bringing him home, but now could never imagine being without him. Bactrian camels in the wild are seriously endangered, with less than 2500 known individuals that have not been domesticated, in and around central and western Asia. Domesticated lines and use of the Bactrian as a beast of burden and fiber (wool) animal dates back roughly 7500 years.